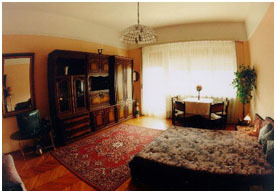 The apartment is situated in the HEART OF BUDAPEST, right on the banks of the Danube near MARGARET-BRIDGE. It is sunny, welcoming, well located and well-equipped. There is a view over the DANUBE, the enchanting MARGARET ISLAND and the BUDA HILLS. This is a lovely apartment which includes a living room, bathroom, kitchen, entrance-hall, and a large sunny balcony. The apartment consists of an elegant room, comfortable beds (all bed linen provided), a large, luxury bathroom with bathtub, wash-basin, towels, and a range of complimentary toiletries. The fully equipped kitchen comes complete with herbs and spices. You can watch TV from the comfort of your bed: choose from ENGLISH, FRENCH and GERMAN channels, all with TXT. Finally, you get the GREAT FEELING that every day is going to get off to a great start when you wake up here! Yes. Just imagine taking BREAKFAST OUT ON THE spacious TERRACE: you breathe in a lungful of pure, fresh air, take in the view and enjoy the balmy breeze over the river - WHAT MORE COULD YOU ASK FOR? Bus 76, which stops right outside the house, takes you to the MAIN RAILWAY STATION. The Underground is only four blocks away, and a major road with other buses and trams is just five minutes walk from the apartment. The apartment is in one of Budapests's MOST DISTINGUISHED, upper-middle-class areas. It's perfectly safe to stroll through the neighbourhood all night. The front gate of the house is always kept locked, and the apartment itself is fitted with THREE LOCKS for your added security and peace of mind. Simply EVERYTHING you could possibly need is within walking distance. A bank, post office, supermarket and laundry are all situated in the same building as the apartment. The local restaurant, a McDonalds, a jazz cellar, a breakfast bar, and an Irish pub are all just a stone's throw away. How much does it cost per night? The price of the apartment is from 26 to 84 EUR per night, depending on the number of nights, the number of people staying and the season. As a small surprise from us to you, you will find a traditional Rose wine in the fridge, the opener and the glasses there are in the glass cupboard. Cheers! If you are interested in this offer please contact us for full details.